Denormalizer creates a single output record from one or more input records. Input records should be sorted. Denormalizer does not propagate metadata. Denormalizer does not have metadata templates. Denormalizer does not require any specific metadata fields. A key that creates groups of input data records according to its value. Adjacent input records with the same value of Key are considered to be members of one group. One output record is composed from members of such group. For more information, see Key. A group may be defined by exact number of its members. E.g. each five records form a single group. The input record count must be a multiple of group size (see Allow incomplete last group). This is mutually exclusive with the key attribute. Denormalize  Definition of how to denormalize records, written in the graph in CTL or Java. The name of an external file, including the path, containing the definition of how to denormalize records, written in CTL or Java. Denormalize class  The name of an external class defining how records should be normalized. In case input records grouping is specified by the Group size attribute, the number of input records must be a multiple of group size. Using this attribute, this condition can be suppressed. The last group does not need to be complete. group size has higher priority than key. If neither of these attributes is specified, all records will form a single group. One of them must specified. Denormalizer receives sorted data through a single input port, checks Key values and creates one output record from one or more adjacent input records with the same Key value. Denormalizer requires transformation. The transformation can be defined in CTL (see CTL Interface) or in Java (see Java Interface) or using existing .class file (Denormalize class attribute). To define transformation, use one of the three transformation attributes: Denormalize, Denormalize URL or Denormalize class. Diagram below describes flow of function calls in Denormalizer. The function append() is called once for each input record. The function transform() is called once for each group of input records. 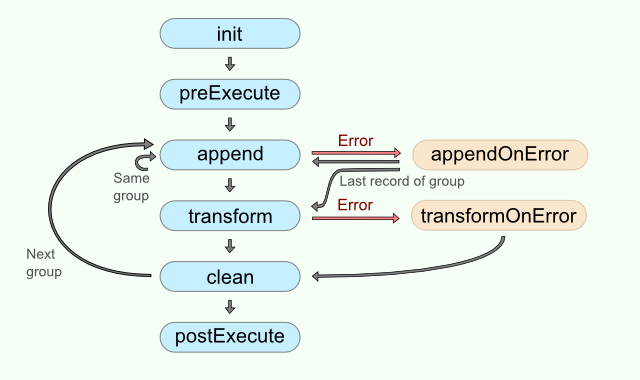 If you do not define any of the optional functions init(), preExecute(), clean() or postExecute(), the execution flow continues with the next function according to the diagram. If you do not specify the appendOnError() or transformOnError() functions and an error occurs, the execution of graph fails. The transformation uses a CTL template for Denormalizer, implements a RecordDenormalize interface or inherits from a DataRecordDenormalize superclass. The interface methods are listed in CTL Interface and Java Interface. Key is expressed as a sequence of field names separated from each other by a semicolon, colon, or pipe. In this Key, first_name and last_name are fields of metadata on input port. Ascending - if the groups of input records with the same key field value(s) are sorted in ascending order. Descending - if the groups of input records with the same key field value(s) are sorted in descending order. Ignore - if the groups of input records with the same key field value(s) are not sorted. The transformation written in CTL uses a CTL template for Denormalizer. Only the functions count() and transform() are mandatory. Once you have written your transformation, you can also convert it to Java language code by clicking the corresponding button at the upper right corner of the tab. You can open the transformation definition as another tab of the graph (in addition to the Graph and Source tabs of Graph Editor) by clicking the corresponding button at the upper right corner of the tab. Description Initializes the component, sets up the environment and global variables. Integer numbers. Negative value lower than -1 aborts processing. Any non-negative value means a successful pass. For the group of adjacent input records with the same Key values, it appends the information from which the resulting output record is composed. If append() fails and the user has not defined any appendOnError(), the whole graph will fail. If any of the input records causes fail of the append() function, and if the user has defined appendOnError() function, processing continues in this appendOnError() at the place where append() failed. The append() passes to the appendOnError() error message and stack trace as arguments. Invocation Called repeatedly, once for each output record. If any part of the transform() function for some output record causes fail of the transform() function, and if the user has defined the transformOnError() function, processing continues in the transformOnError() at the place where transform() failed. The transformOnError() function gets the information gathered by transform() that was get from previously successfully processed code. Also error message and stack trace are passed to transformOnError(). Called repeatedly, once for each output record. The clean() function is called after the transform() function. Description Returns the component to the initial settings. Invocation Called if append() throws an exception. The function handles errors which occurred in the append() function. If any of the input records causes fail of the append() function, and if the user has defined the appendOnError() function, processing continues in this appendOnError() at the place where append() failed. The appendOnError() function gets the information gathered by append() that was get from previously successfully processed input records. The error message and stack trace are passed to appendOnError(), as well. The function handles errors which occurred in transform() function. If any part of the transform() function fails, and if the user has defined the transformOnError() function, processing continues in the transformOnError() at the place where transform() failed. The transformOnError() function gets the information gathered by transform() that was get from previously successfully processed code. The error message and stack trace are passed to transformOnError(), as well. The function transformOnError() creates output records. Description Prints the error message specified and invoked by the user. Called in any time specified by the user (called only when either append(), transform(), appendOnError() or transformOnError() returns value less than or equal to -2). Input records or fields are accessible within the append() and appendOnError() functions only. The transformation implements methods of the RecordDenormalize interface and inherits other common methods from the Transform interface. See Common Java Interfaces. See Public CloverDX API. Initializes denormalize class/function. This method is called only once at the beginning of denormalization process. Any object allocation/initialization should happen here. Passes one input record to the composing class. Passes one input record to the composing class. Called only if append(DataRecord) throws an exception. Retrieves composed output record. For detailed information about return values and their meaning, see Return Values of Transformations. In Denormalizer, only ALL, 0, SKIP, and Error codes have some meaning. Retrieves composed output record. Called only if transform(DataRecord) throws an exception. Finalizes current round/clean after current round. Called after the transform method was called for the input record. Input records acquired from relational database contain fields companyName and product. Convert the records to following form: companyName is followed by list of products separated by commas. Use the Key and Normalize attributes. Records with the same Key have to be available in input data all at once. Otherwise you will get a new output record for each several subsequent records having the same key. The best solution is to have input records sorted by Key. Given a list of students. Convert the list to groups of 3. Each group (one output record) has a number and names of its members. The names are separated by comma. Each output record contains groupNumber and members. Use the Group size and Normalize attributes. To be able to process the number of record not being divisible by 3, you need the Allow incomplete last group attribute. If the transformation is specified in an external file (with Denormalize URL), we recommend users to explicitly specify Denormalize source charset.